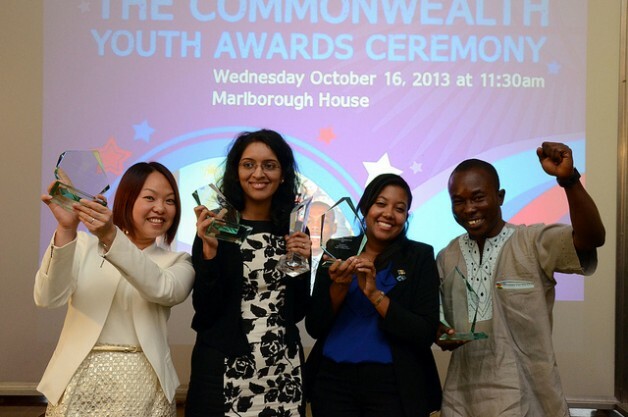 Nominations are now open for the 2015 Commonwealth Youth Awards for Excellence in Youth Development Work. The annual awards recognise the invaluable contribution of young people to development, in community, national and global contexts. Part of the Commonwealth Youth Programme, the awards provide a platform to showcase and expand the work of outstanding young people across the 53-nation Commonwealth community. Nominations for 2015 should demonstrate how a young person’s work, whether professional or voluntary, has helped to promote a development goal, such as empowerment of marginalised groups, education for all, peace, democracy, human rights, health, sport and culture, or protection of the environment. Four finalists from each region (Asia, Africa & Europe, Caribbean & Americas, and Pacific) will be selected, and from these sixteen finalists, one from each region will receive a regional Commonwealth Youth Award. Each finalist and winner will receive a cash prize, and the regional winners will also travel to London in Commonwealth Week in March 2015, where the overall pan-Commonwealth Commonwealth Youth Award winner will be announced. Click http://www.yourcommonwealth.org/cya2015 to download the application form. Posted on September 8, 2014, in Africa, Career, Competitions, Entrepreneurship, Fellowship, Gender, Women, Girls, Global, Social Entrepreneurship, Technology and tagged #Awards, Apply! 2015 Commonwealth Youth Awards for Excellence in Development Work, Commonwealth, Commonwealth community, Commonwealth Students Association, Commonwealth Youth Award winner, Commonwealth Youth Award., Commonwealth Youth Awards for Excellence, Commonwealth Youth Awards for Excellence in Youth Development Work., Commonwealth Youth Programme, Your Commonwealth, Youth Development Work.. Bookmark the permalink. Leave a comment.